The Apple Watch is increasing its appeal by increasing its maximum band sizes, making the iPhone-compatible smartwatch fit for people with bigger wrists, too. That's wonderful news because, in letting everyone I meet try on my Apple Watch, it's been a snug fit at times. The swappable medium-large band size that comes in the box doesn't always help. The Apple Watch face is appreciably smaller than bulky Android Wear watches, but there's no reason the Apple Watch band size should be shorter. 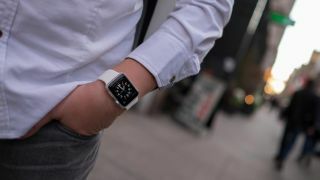 The new band length goes from fitting wrists that are 210mm to 245mm, notes 9to5Mac, and costs the same amount as a normal band at $49 (£39, AU$79). Although Apple is opening up its smartwatch to more wearers with this move, the new bands are only available in two flavors. The entry-level Sport Band now comes in a "Large and Extra Large" size, with a "Medium and Large" sized band also in the box. But the only colors so far are black and white. The price for these bands is also deceptive. It costs $49 (£39, AU$79) for the extra-large Sport Band, but you can't buy it with the watch just yet. It'll be an exchange or extra purchase. The 42mm Link Bracelet kit, similarly, expands Apple's classy stainless steel band for wrists that exceed 205mm, but it's only available in steel (not black) and is an add-on, not a replacement. It's still good news for iPhone owners who want a properly fitting wearable, without having to wait for the inevitable Apple Watch 2 refresh.